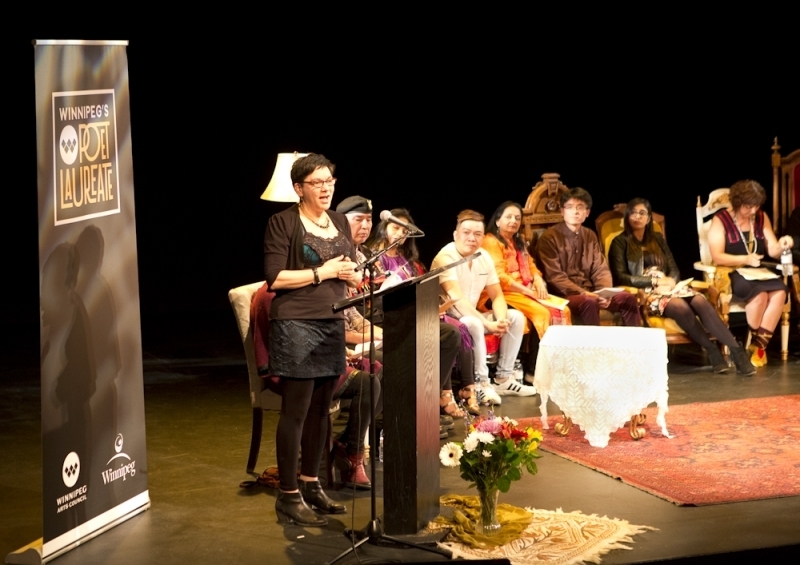 Thank you, Winnipeg, for a beautiful multi-language poetry celebration! World Poetry Day was invented by UNESCO in 1999, as a millennium project, to celebrate heritage languages and poetry around the world. 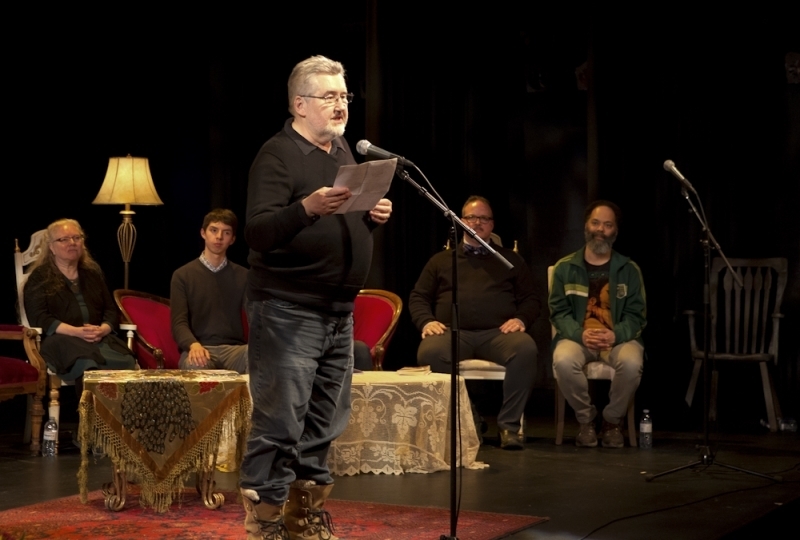 In this spirit, Winnipeg's first Poet Laureate, Di Brandt, together with the Winnipeg Arts Council, hosted World Poetry Day: Poetry in Many Languages, on Friday, March 23, 2018, at the Gas Station Theatre in Osborne Village. 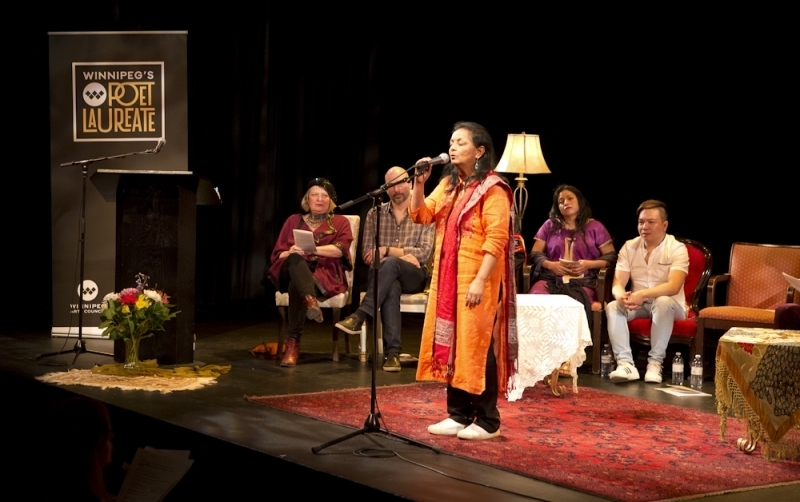 The evening featured 16 presenters from all walks of life, reading, reciting, chanting, dancing and singing poems, mostly in their mother tongues. 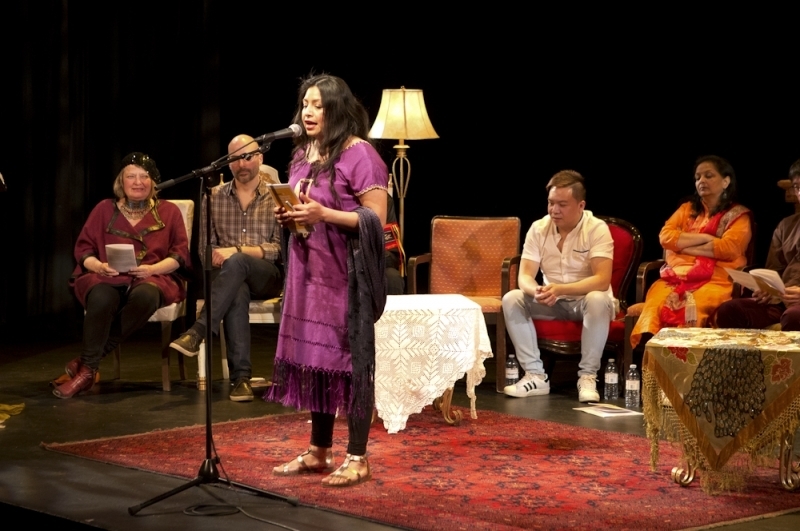 The poems ranged from an ancient Sanskrit shloka, "Sarve Bahanvantu Sukinah" from the Brihadaranyaka Upanishad chanted by biologist Nandita Selvanathan, to a 12th century poem in Mandarin, "Prelude to Water Ripples" or "Shuǐ Tiáo Gē Tóu" or 水调歌头 by Su Shi of the Song Dynasty in China, performed by Dr. Wei Zou, who newly arrived in Canada from Beijing one year ago. 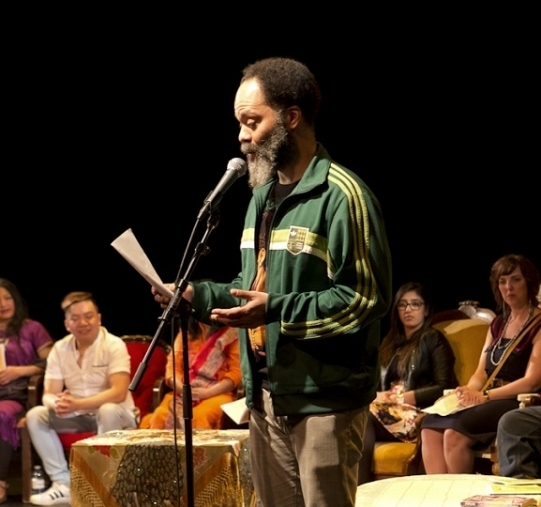 Ismaila Alfa, known to Winnipeggers through his popular CBC Radio show Up to Speed, presented "The Passage," a contemporary poem by Biafran poet Christopher Ikigbo. 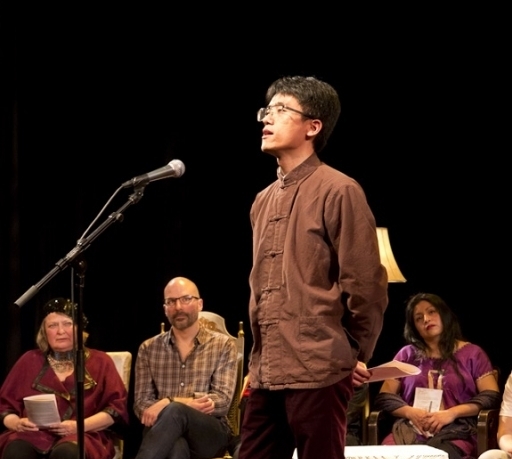 Timonthy Dang, or Thanh Đặng Phước, one of the owners of the popular Ban Mi King Vietnamese restaurant on Portage Avenue, read part of Viet Nam's iconic epic poem Truyện Kiều or 傳翹 or The Tale of Kiều by Nguyễn Du. 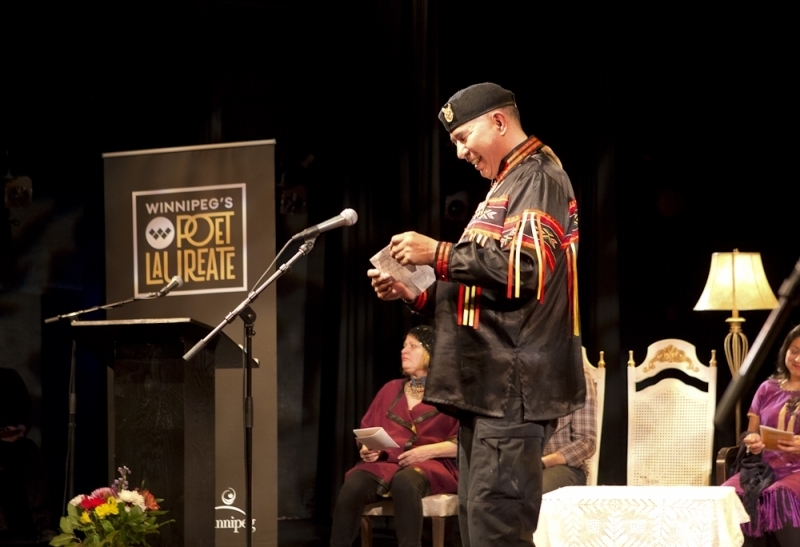 Other highlights included a poem in Ojibwe by local Anishinaabe poet Patricia Ningewance, "Odoozhibii'igan: Egwenaweniminaan" or "Pat's Poem: Missing You," read by her grandson Aandeg Muldrew. 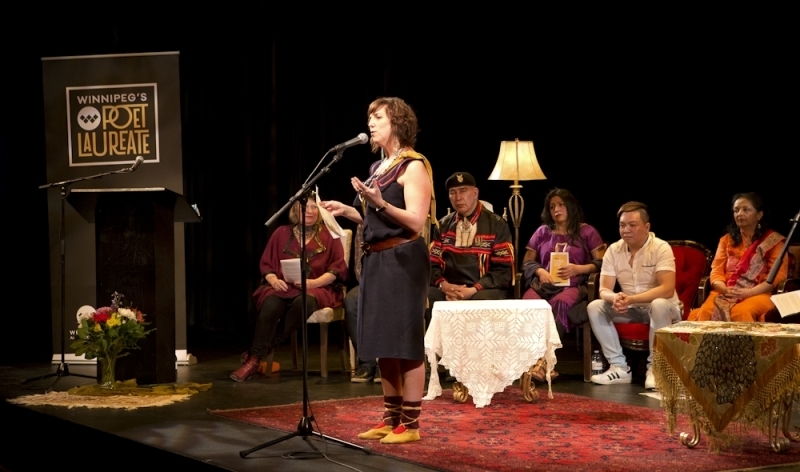 Goonigishig; "Round Dance," by Sarain Stump, written in English, and translated into Cree and memorably performed by Horace Massan; and Louis Riel's famous celebration of the formation of Manitoba in the voice of one of the "mothers of Canada," "La Métisse," vividly performed by Ginette Lavack. Another highlight was Jordan Sangalang's poignant rendition of Filipina poet Micheline Miclat's poem "My Father and I" in American Sign Language. 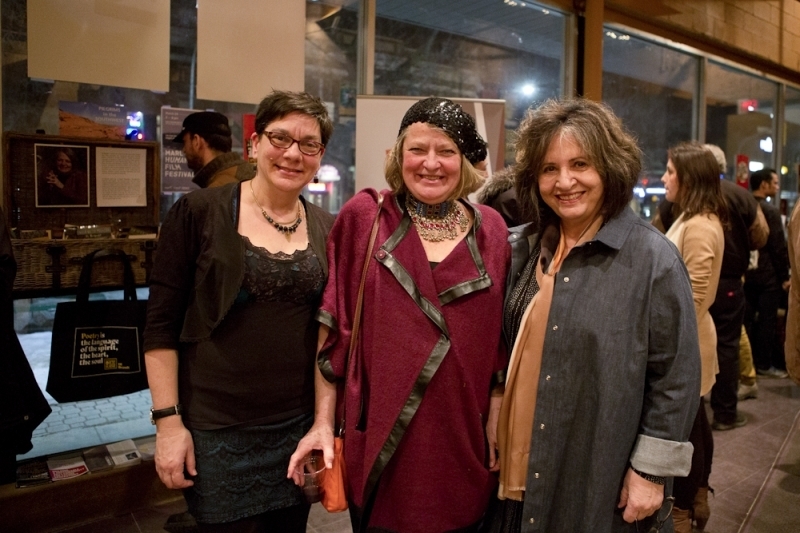 Jane Enkin sang a haunting song by Yiddish poet Morris Rosenfeld, "Mayn Ruh Platz." 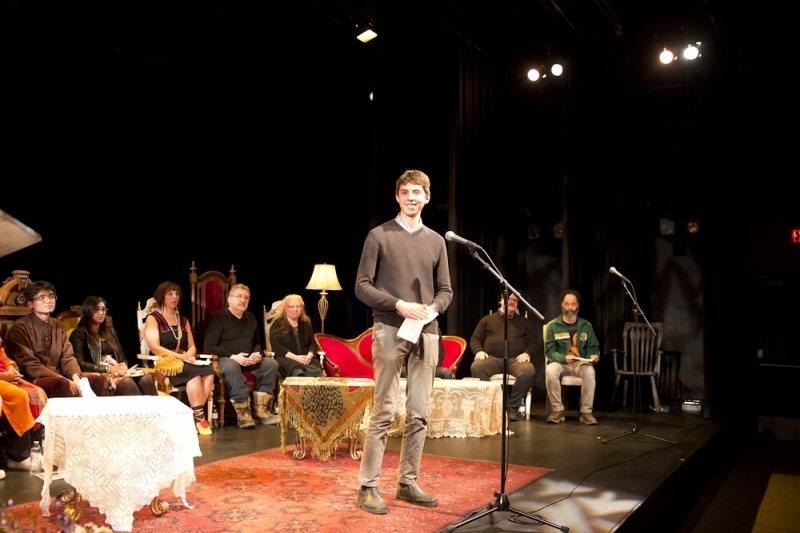 John Peter Buchan entertained us with a hilarious patois mash-up of English and Icelandic, in the poem "Winnipeg Icelander" by Gotormur J. Gottormsun. Daniel Roy's lively performance of George Morrissette's "Le Violon du Sainte-Boniface" included gestures of fiddling and jigging. Guadelupe Carolina Martinez Mendoza, newly arrived in Canada from Mexico, gave a gorgeous performance of "La tierra que piso" or "The Ground Under My Feet" by Rosario Castellanos Figueroa. 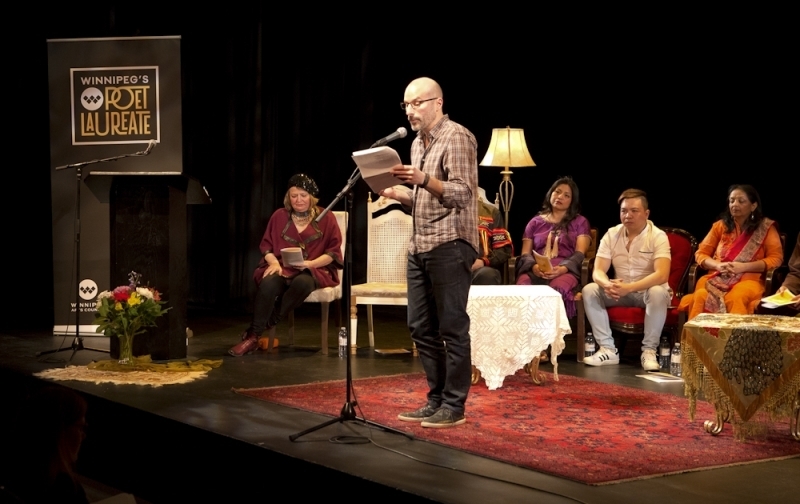 Well known literary editor Andris Taskans read a moving poem in Latvian, "The Black Lief" or "The Black Time" by Vizma Belševica. 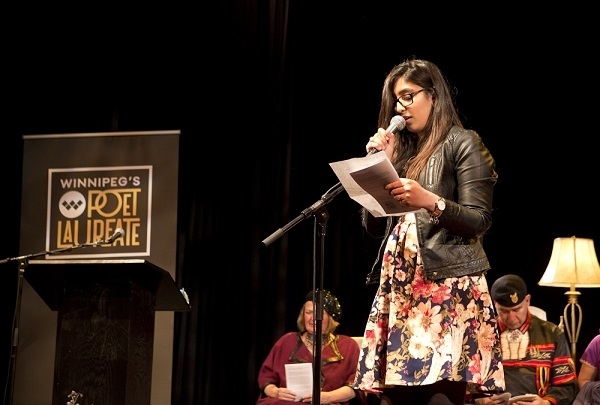 University of Winnipeg student Arshpreet Dhaliwal performed "Peedan da Paraga" or "Sheaf of Sorrow" by Punjabi poet Shiv Kumar Batalvi. 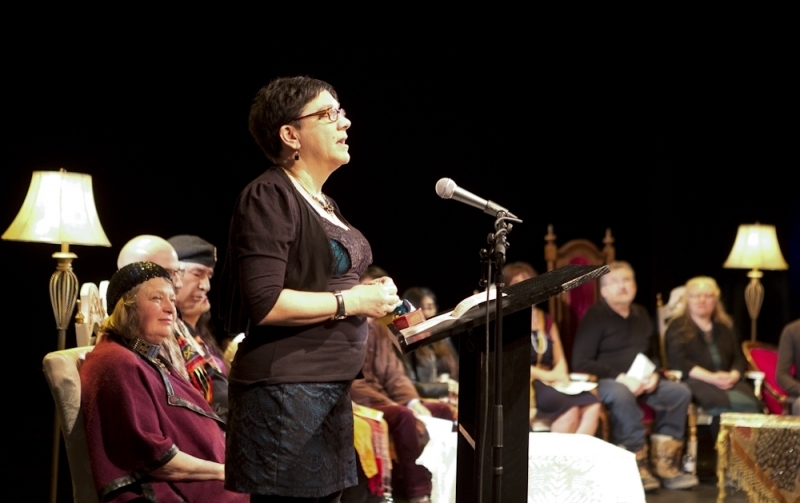 The evening was well attended by people from across the city, and we all enjoyed greetings and a fine recitation of an ee cummings poem by Winnipeg Deputy Mayor Jenny Gerbasi. 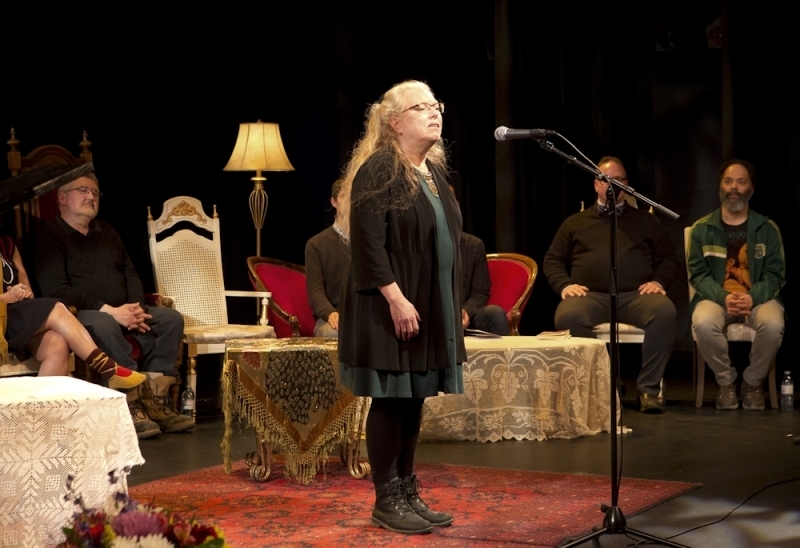 Di Brandt, Winnipeg’s first Poet Laureate and emcee, took off her emcee hat to join the presenters in reciting the German children's hand game "Himplechen und Pimplechen." 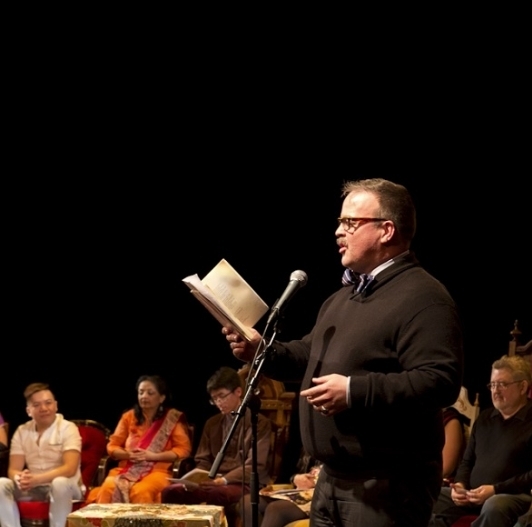 It was a deeply moving experience to hear people reciting heritage poems in their heritage languages. 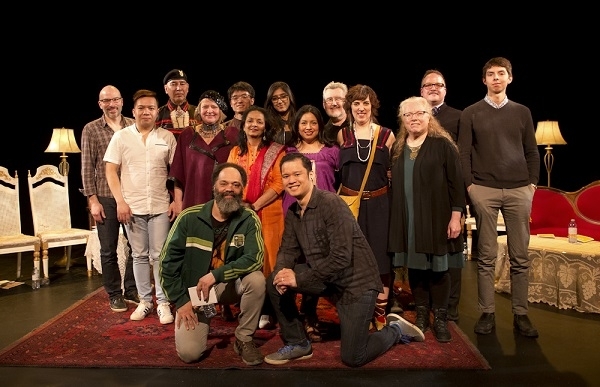 It opened a window into the grandeur and sorrow and sweetness of the world's rich poetic and cultural inheritance in many languages, and showcased the multicultural life of Winnipeg in its most tender and vibrant public aspect. 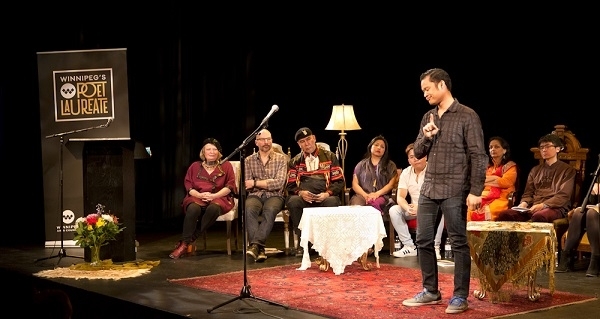 If you missed this year's event, look out for it next year - we hope this inspiring event will become an annual feature in Winnipeg's cultural landscape!